Today’s feminists have a tendency to throw around words like “intersectionality,” but rarely seem to understand the complexities of its implications. We give lip service to women of color by calling ourselves “intersectional feminists” when in reality, we misunderstand the larger context of the discussion. In this same vein, we equate work regarding reproductive rights to working in a framework of reproductive justice. Both are, in their own way, valuable– but they are not synonyms. Reproductive rights refers to the distinct fight for liberty regarding reproductive health, usually framed as “choice”: access to reproductive health care, including abortion and a right to safe and freely practiced sexuality. The movement is commonly associated with abortion access, and thus, grouped in with second-wave feminism. Our narrative of second-wave feminism is distinctly white in its view, focusing on the work of liberal feminists such as Betty Friedan and Kate Millett. Reproductive rights are, as the name suggests, a core pillar of the reproductive justice movement. But, the key difference is the scope of the movement. Originating from SisterSong, a women of color feminist collective, in the mid-1990s, reproductive justice expands far past the pro-choice movement. The framework recognizes that no matter if we can access reproductive health care, we cannot be free until our basic human rights are met. The movement originates from women of color’s disillusionment with the view that our reproductive rights start and end at abortion. They emphasize the difference between access and choice: we can have the right to choose, but it is not until care is physically accessible that we will be free. We run into trouble when we make sweeping statements, but the right to choose is useless unless we live lives that are free from violence, where we are free to parent in safe communities, and when queer people live lives free from oppression–to name a few examples of issues that fall under the wide umbrella of reproductive justice. Reproductive rights are only the edge of the issue when discussing reproductive justice. We must consider that limiting the definition of reproductive justice to reproductive rights is a form of white feminism and an erasure of women of color, indigenous peoples, trans and queer people and beyond. In our contemporary moment, we are discussing what will happen if, or when, Roe is overturned. This does a disservice to the model of reproductive justice, and to others who are not afforded full liberation in reproductive health. Of course, we need to plan for a post-Roe world, but we also must keep in mind that the attack on our rights will begin in small ways: in mandatory waiting periods, in immigration injustice, in bathroom bills, in poor minimum wage laws. These actions inhibit access to care by way of chipping away at human rights– and thus work against the reproductive justice framework. Those in the reproductive rights movement must recognize that our fight cannot begin and end with merely protecting Roe. I would dare to say that Roe doesn’t necessarily mean much if care is not actively accessible. While the fight strictly for choice is necessary, it is one that cannot exist by itself. A prescription is for all of us, then, even those of us who identify the most with the struggle for abortion rights, to do activist work in the next few weeks that expands outside of abortion and reproductive health care. Particularly as the rights of trans and non-binary peoples are under attack, can you donate money or time to an organization supporting trans folks? Can you fight for universal child care, particularly for people of color? Can you read or consume the work of women of color, queer people of color, or disabled people of color? The answer here is yes. 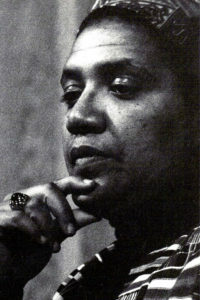 Audre Lorde questions in her seminal feminist text “The Transformation of Silence into Action” a central question to us at this moment: are you doing your work? She specifically is asking this of white women. Are we actively supporting feminists outside of our own racial, gender, and class groups? If the answer is no, reassess your feminism. This is not to say that our fight to keep abortion safe and legal is not an important one — it still is. But right now, we must focus on the issues that get less attention. We must fight together to understand our lives and work in this model of reproductive justice. We must do our work and ask of others to do theirs.